This tool can analyze and generate Pokémon Conquest passwords. See the readme for more details. Source is included, but it's pretty sloppy. Please don't submit passwords generated with this to sites such as GameFAQs. - Fixed randomization (clicking To Data now selects a random scramble pattern). - Compiled with .NET Framework 2.0 instead of 4.0. 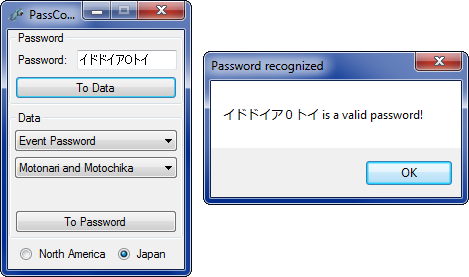 PassConqueror - Pokémon Conquest Password Generator 1.1.2 NEWEST!